This tool allows the analytic (i.e. without running a simulation) determination of stable states of the model. All stable states are determined, regardless of their reachability, using an algorithm described in Naldi2007. The stable state identification tool is available from the Compute stable states option of the Tools menu. 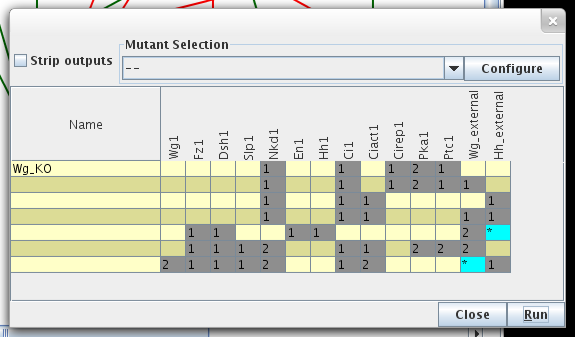 The stable states dialog box allows to run the analysis after the optional selection of a perturbation. The result is shown in a table in the same dialog box, allowing to launch a novel analysis for another perturbation. A "*" in the table denotes that each of the values of this component gives rise to a stable state (or several if another "*" appears in the same row). Stable state search was first implemented in GINsim 2.3. The implementation is now part of the Logical Model project.